'2018 is looking to be the greenest year yet for the auto market,' Edmunds analysts say. The nation's roads are about to get greener. The overall market share for green vehicles is on pace to jump to 4.4% of the overall vehicle market in 2018, compared to 3.2% this year, according to analysts from Edmunds. "2018 is looking to be the greenest year yet for the auto market," Edmunds said in a Monday note. Plug-in vehicles could see sales double next year, on track to outsell traditional hybrids before 2018 is out. That comes even as investors harbor continued concerns that industry leader Tesla Inc. (TSLA - Get Report) won't be able to deliver on its promise to place Model 3s across the U.S. Earlier this year, Tesla chief Elon Musk insisted his electric car company would ramp up production to 5,000 cars per week by the end of 2017. The company has whiffed on the goal by a long shot, delivering 222 Model 3s in the third quarter. "Even if Tesla doesn't meet its full production commitments for the Model 3 until midsummer, 2018 will still be a hallmark year for green vehicles," said Jessica Caldwell, Edmunds executive director of industry analysis. "The price of batteries is coming down, EV range is rising, and shoppers will have more choices than ever. However, the lower end of the EV market will feel pressure once federal tax credits start to wane toward the latter half of the year, which will give the first indication of how ready the segment is to stand on its own," Caldwell said. 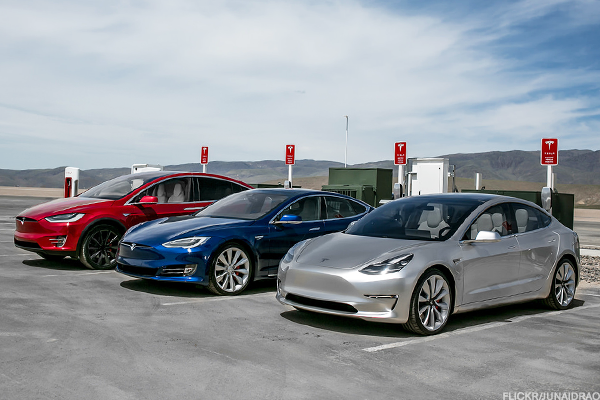 While electric model sales are teed up for solid gains, overall car sales are expected to shrink for the second year in a row in 2018, Edmunds said. Analysts predict a total of 16.8 million vehicles sold next year, down from 17.2 million in 2017. "The rise in green car sales is really just a precursor to what OEMs have in the works for the autonomous vehicles promised for 2019 and 2020," Caldwell said. "2018 will be a year of right-sizing for the present while putting some of the critical building blocks in place for the future."